Lord Alton speaking on the plight of Christians in Syria at Farm Street, London, the days sfter the murder of Father Frans van der Lugt, shot dead on Monday (7th April) in the Old City of Homs. Will anyone stand up for persecuted Christians? 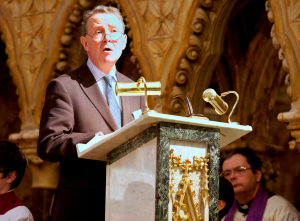 CHRISTIANS in the Middle East and elsewhere are suffering “systematic killing and outright persecution”, according to a leading Catholic human rights campaigner, and yet the West’s response is to ignore it “without barely a murmur of protest”.